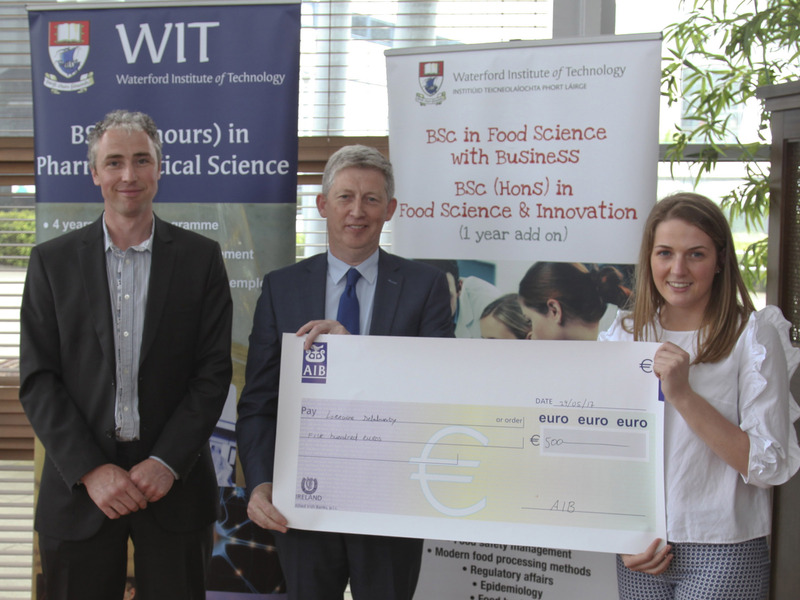 The Department of Science at Waterford Institute of Technology (WIT) recently held its Industry Sponsored Awards Day 2017 which was sponsored by Sanofi, Society of Irish Foresters, Dawn Meats, Comeragh Veterinary practice, Dairymaster and AIB. Students from courses across the department were presented for their outstanding projects and performances throughout the year. BSc (Hons) in Food Science and Innovation student Chloe Hehir was recognised by Dawn Meats as the Product Innovation Award winner 2017. Chloe developed a protein enriched beverage for the elderly available in fruit and vegetable flavours. In picking Chloe, the judges highlighted her passion for her chosen product, while also praising the high quality of both product and packaging. BSc Agriculture student Des Twomey and Stephen Kearns both came in third place for the Agriculture award, which was sponsored by Comeragh Vets. BSc (Hons) Land Management in Agriculture student Lorraine Delahunty was the overall winner of the Final Year Project Award which was sponsored by AIB. Eoin Lyons was a close runner up in second place for the Final Year Project Award, followed by Denis Brereton in third place. The overall winner, Lorraine, received a prize of €500, with €300 and €200 respectively being awarded to the Eoin and Denis. Students of the BSc (Hons) in Pharmaceutical Science course Anthony Curtis and Michael Minchin were the winners of the Final Year Research Project Poster Award which was sponsored by Sanofi. All students involved were required to analyse and summarise their laboratory work carried out over the semester and design, prepare and present an A0 poster to staff and students. Each student presented a 3 minute pitch and answered questions on their project by the assessing staff members. The Augustine Henry Medal Award sponsored by the Society of Irish Foresters was presented to third year BSc in Forestry student Eoin Galvey. The Augustine Henry Memorial Medal is awarded annually by the Society of Irish Foresters to recognise academic achievement in memory of Professor Augustine Henry, an internationally recognised plant collector and sinologist, who was founding Professor of Forestry at University College Dublin and assisted the development of the Irish Forest Service and the establishment of an Irish forest resource after centuries of active destruction and neglect. BSc (Hons) in Agricultural Science students Robert Tobin and David Corbett were awarded the Dairymaster Student Award.